On the good side – it’s been two years since I last address this issue. That’s what being the 900 pound gorilla will do for you – but there’s competition in the works. One of these days I’m going to be wrong; but perhaps not today. Over on seekingalpha.com, I found this interesting report “LinkedIn Now Has Some Serious Competition“. The gist – a product called BranchOut is allowing the Facebook platform to be used for more recruiting and job seeking activities. It doesn’t seem to be the same sort of interaction. Take the Facebook site with easy follows, fan appreciation, and non-business socialization – and try to network through your friends to VIPs that might hire you. Oh – sure – I think it will help some people find jobs and companies find employees, but will it really change the face of “posted jobs”? And will it help professionals reach into organizations through introductions? The BranchOut web site doesn’t even indicate a means to do that – it talks about posting, posting through friends, and the great potential on Facebook – but not so much about relationships. 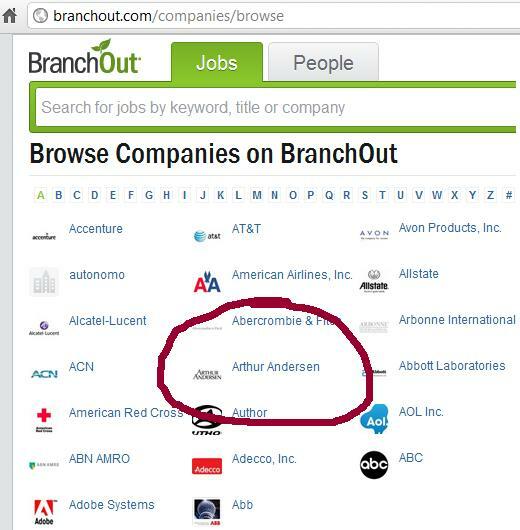 Yes, I found it quite interesting that Arthur Andersen was one of the many companies on BranchOut – and had their own page. Back in early 2010 I reported that Rupert Murdoch was closing down the social experiments lab – they hadn’t yet built an app to kill LinkedIn. And so as the reigning champion, LinkedIn is required to beat back every challenger, and one of these day it may well lose. But it doesn’t seem likely today. No related posts were found, so here's a consolation prize: The LinkedIn Personal Trainer – For A Dollar.